London needs to address ‘invisible’ air pollution as the biggest cause of early deaths after smoking. 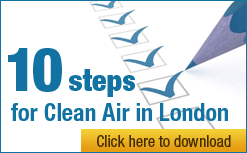 On 2 February 2012, Clean Air in London (CAL) published its manifesto for the Mayoral and London Assembly elections which set out the steps needed to address the biggest public health crisis for decades. The manifesto argues that through a mixture of political will, behavioural change and technology London can lead the world in tackling air pollution as it did after the Great Smog of 1952. Underpinning these themes are several principles. First: ‘The London Matrix’ which shows that by complying fully with air quality laws in London (or any large city) it is possible to show the world how to tackle wider air pollution, climate change and sustainability issues in all big cities. Second: ‘The London Circles’ which are two overlapping circles representing traffic measures to address congestion and harmful emissions with each offering secondary benefits for the other. Third: ‘The London Principle’ which states it may be necessary to accept a 1% increase in carbon dioxide (CO2) emissions to achieve a 10% reduction in harmful emissions (and vice versa). Fourth: sustainable solutions require emissions to be reduced at source; off-setting measures are never sound since they do not stop human exposure to harmful emissions and sooner or later they have no effect. The Greens have made the most strident commitment to air quality, stating that they will ‘comply with air quality laws, urgently developing plans to meet this commitment whether the Government plays its part or not’. Only the Greens make a commitment to address immediately emissions from buses promising to ‘retrofit all buses immediately if technology is shown to work’. The Greens will ‘ensure that all new buses are low emission hybrid, hydrogen or electric models within one year of being elected and that the entire fleet runs on this technology by 2016’. The Greens and Liberal Democrats want a new approach to LEZs and advocate an additional smaller LEZ for central London. The Greens also advocate an additional LEZ around Heathrow. Only the Greens specifically mention working with the Government to reduce emissions from trains. The Liberal Democrats will ‘revise the Air Quality Strategy to set out exactly what needs to be done and by whom to achieve clean, healthy air for Londoners’. While Labour and the Greens have produced proposals to electrify the London bus fleet, the Liberal Democrats have made a very convincing case for their ‘Big Switch’ to move London’s bus, taxi and public service vehicles to battery electric propulsion. The Liberal Democrats and Greens want a new approach for LEZs and advocate an additional smaller LEZ for central London. The Liberal Democrats, Greens and Labour support measures to make cycling safer and more attractive. All three want to expand London’s network of ‘Greenways’ and support London boroughs to expand 20 mph zones in residential areas. Labour will engage directly with the European Commission ‘to agree a plan for how London can meet European air quality standards’. Labour has made a commitment to run a trial of battery electric buses that use induction (i.e. wireless) charging. Labour wants to establish ‘Clean Air Zones’ around schools. Labour, Greens and Liberal Democrats support measures to make cycling safer and more attractive. They all want to expand London’s network of ‘Greenways’ and support London boroughs to expand 20 mph zones in residential areas. Astonishingly, Boris Johnson has no new policies in his manifestos to reduce air pollution. The Conservatives (mistakenly) downplay air quality as a significant problem for London and include it in their economy manifesto. Mayor Johnson demonstrates his lack of understanding of the issues by promising to ‘continue a 100% congestion charge discount for low emission vehicles so there is a real financial incentive for Londoners to drive the cleanest vehicles available’ when it is a measure aimed at reducing CO2 emissions that increases the number of vehicles entering the zone and encourages those producing the most harmful emissions i.e. diesel. In a separate media release, Boris Johnson’s campaign team claims Stockholm and Zurich have worse air quality than London which is laughable if it did not show such a serious lack of understanding. Boris Johnson has also confirmed his commitment to measures at PM10 hotspots which include using the Pollution Suppressor in front of air quality monitoring stations (despite this being condemned by the three other candidates). Boris Johnson is being supported by the Government in both negative activities. More particularly, the Government has: confirmed its support for the use of the Pollution Suppressor and issued a non-smog alert on 3 April in response to media concern on the issue and; and stated it will ‘use the European Commission review of air quality legislation, expected in 2013, to seek amendments to the Air Quality Directive which reduce the infraction risk faced by most Member States, especially in relation to nitrogen dioxide provisions’ (page 7). After a detailed analysis of the manifestos for the Mayoral election, CAL encourages voters to: choose Jenny Jones (Green) (who scored nine out of 10) or Brian Paddick (Liberal Democrat) (eight out of ten); and give their second preference to Ken Livingstone (Labour) (seven out of 10). Boris Johnson (Conservative) scored minus two out of 10 and ranks last. Other issues that must still be addressed by the next Mayor include: air pollution in the London Underground; harmful emissions from buildings and within them; and ensuring air quality laws are fully complied with during the London 2012 Olympics. There is a stark choice for Londoners on 3 May. At its simplest, all the candidates, except Boris Johnson, would warn Londoners about smog episodes not use the Pollution Suppressor in front of official air quality monitors. Vote for change if you want clean air in London.